Remember how cold it got last winter? Well, we are expecting to have one just as cold if not colder this year. Winter can actually be very nice in Winston-Salem. Often, we enjoy the respite from the hot months. However, it is only pleasant if you are comfortable. 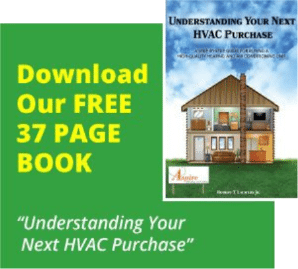 Are you tired of dealing with a broken HVAC system? As a result, do you find yourself having to wear layers of clothing inside your home in order to stay warm? If so, you definitely will not enjoy the winter. To avoid this, you need to find a heating repair Winston Salem NC company that provides quality service. When it comes to HVAC systems, no other heating repair Winston-Salem company has the expertise that you find at Aspire. For years, homeowners all over the area have trusted us to make sure their systems always function properly. Therefore, whatever is wrong with your HVAC, our pros will diagnose the issue and come up with the best solution. We will make the necessary repairs which will ensure that your system will keep you warm throughout the winter. Regardless of which type of system you use to heat your home, our experts will be familiar with it. Whether you have a heat pump, geothermal unit, or gas or oil furnace, we have plenty of experience with it. Additionally, you can call on our experts when you have a problem with a water heater. Then, if you need a new water heater, we carry only top-quality brands and can install it immediately. Also, we work with you to provide the equipment you need at a price you can afford. To that end, we offer several financing options, so that you don’t have to wait when you have a major issue in your home. We offer several maintenance plans, so that your heating and cooling systems are always performing properly. By checking your systems on a regular basis, we find small problems before they become major, expensive repairs. Review our plans and choose the one that fits your needs. The temperatures in the Winston-Salem area have already dipped below freezing a few times. If you’re feeling the chill in your home, get in touch with the premier heating repair Winston Salem NC company- Aspire Heating & Cooling. We are proud to offer discounts to veterans and seniors. Today, for a free quote on any service, call us at 336-936-9111 or just fill out our online contact form.